The No. 17 Huskies defeated the Bryant Bulldogs in their season opener Friday night, 66-53. Not everything went as planned in Storrs, Conn. for a team that received its National Championship rings prior to the game. UConn was on the wrong end of a 18-0 run halfway through the first half and found themselves down by as many as nine points to the Bulldogs right after halftime. That was when senior Ryan Boatright came to the rescue, scoring 16 of his 24 points in the second half. In addition to his 24 points Boatright finished with eight rebounds, five assists and four steals on 7-15 shooting from the floor. The Huskies were lucky their opposition was a Bryant team that seemed unprepared for the intense ball pressure UConn would apply in the second half or this celebration-filled day might not have ended as nicely. I am a huge Boatright fan and love his intensity and defensive capabilities, but it scares me how much this team, granted one that has many new faces, relied on Boatright against Bryant at home. As I tweeted this cannot keep up against better competition if the Huskies plan on staying ranked in the top 25. Once the Huskies gets a few more games under its belt I do believe this team will be ready to compete with the Texas’s and the Duke’s of the college basketball world (both of these teams come to Connecticut to play the Huskies before Christmas). Having these games at home is huge for a team with as many new faces as UConn has. Junior college transfer Sam Cassell Jr. started last night as did freshman Daniel Hamilton. Both looked much more comfortable by the second half, and Hamilton’s deadly mid-range game has to become a bigger part of UConn offense as the season goes on. Kentan Facey was on the team last year during their championship run, but barely played. He was the game’s leading rebounder last night at 6-foot-9 and will be a key piece when the Huskies take on teams with big players in the front court. Somehow I have managed not to mention UConn’s biggest (literally) key to their defense. Connecticut is a noticably different team defensively when sophomore Amida Brimah is on the floor compared to when he is not, and that could be seen clearly against Bryant. Brimah was the biggest player on the floor last night and he played that way, recording 12 points, five rebounds, five blocks and maybe most importantly only two personal fouls. Unfortunately, as good as Brimah is defensively, he still lacks the offensive game the Huskies desperately could use. Granted there are not many post players today who you can run your offense through, but Brimah still lacks any kind of moves that scare a defense. He is not attracting a double team any time soon, and boy would that take this perimeter-oriented UConn team to the next level. The good news is two important players sat out against Bryant for different reasons. Sophomore guard Rodney Purvis, who sat out last season after he transferred from North Carolina State, was suspended for one game and has been referred to by head coach Kevin Ollie as the Ferrari in the garage he couldn’t drive. Junior guard Omar Calhoun also missed the game due to a sprained ligament in his right knee. UConn’s next game is their first of the Puerto Rico Tip-Off tournament against the College of Charleston on Thursday. The Huskies could see the likes of Dayton, New Mexico and West Virginia as they advance in the tournament. It will definitely be fun to watch this Huskies’ team grow and develop as the season goes on, lead by yet another star point guard. 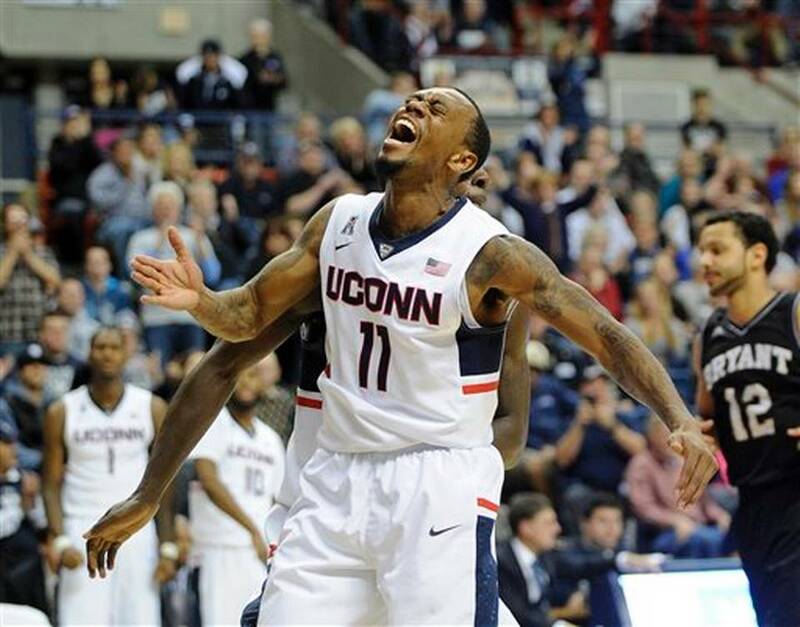 As UConn fans let’s just hope that Boatright gets some consistent help so he is not forced to carry the ship and drive. This entry was posted in CT Sports, Home and tagged Amida Brimah, Connecticut, Duke, Ferrari, Huskies, Kevin Ollie, Omar Calhoun, Puerto Rico Tip-Off Tournament, Rodney Purvis, Ryan Boatright, Sam Cassell Jr., Texas, UConn, University of Connecticut. Bookmark the permalink.